This is one of the a dies fasti on which legal actions are permitted. This is the second day of the Festival of Mars. The daily spectacle of the priests of Mars carrying shields, leaping and dancing through the streets of Rome would continue this day. Mars was known to the Greeks as Ares, the god of war. Ares was often accompanied in his bloody campaigns by Enyo, the murderess goddess of war who was known as Bellona by the Romans. Ares paid no attention to which cause was right or wrong and was concerned only with where he could cause maximum carnage. The Romans held a milder, more honorable view of Mars, honoring him as the son of Zeus and the father of Romulus. 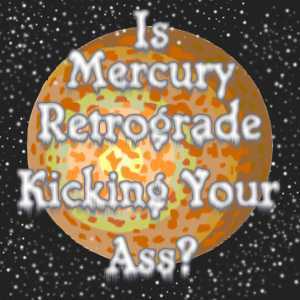 Mercury "goes retrograde" in Pisces, until March 25. For the most mercurial people, not just Gemini and Virgo natives, but anyone with Mercury promimently positioned or related to other planets - this can be the most trying, maddening, fury-flavored Mercury retrograde time of them all. Mercury is said to be "in detriment," or "in fall" in Pisces - or even both. One way to get the picture is to imagine that all the usual troubles with commerce, communication and transportation that come during Mercury retrograde are happening, only now they're either in a chilly fog or downright underwater, and the people you ask for directions to some warm, cheery place are either on drugs or deceiving you for the sheer perverse fun of it. Mercury retrograde in Pisces: there is, thanks be to whatever one worships, nothing quite like it. This day is sacred to Ceadda, god of healing springs and holy wells. He is also known as Saint Chad of Lichfield. His symbol is the Crann Bethadh, the tree of life. Born in Northumbria, Chad became an abbot in Yorkshire, founded a monastery in Lincolnshire, and a bishop of the Mercians at Lichfield. His name is associated with wells and springs that heal. He is also noted for his love of walking. St Theodore of Canterbury insisted he ride a horse because walking was beneath him. Be the weather good or bad.